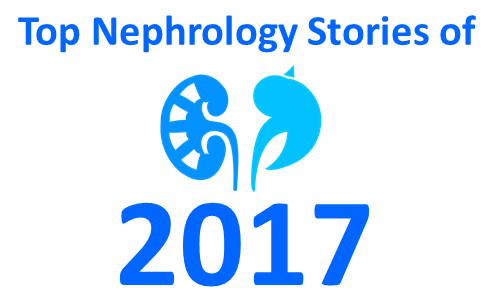 2017 marks the 8th year of the Top Nephrology Stories post on RFN. Below are links to the last 7 years of the top nephrology stories hosted on RFN. This study had it all: hermetically sealed Russian cosmonauts, a link to the red planet, big name authors, and a New York Times article telling us that “Everything We Know about Salt May Be Wrong”. So what was it? The authors recognized the unique opportunity to study long term sodium balance in man afforded by two simulated space flights to Mars, one for 105 days and one for 520. What they produced was a 12 page article and 1131 page data supplement that both reinforced some long held concepts of Na/H2O balance and raised a few new ones too. In terms of reinforcement of “known knowns”, the study showed that with a higher dietary salt intake urine concentration rises and so does free water generation. In addition, our ideas about the effects of aldosterone on sodium excretion were well backed up by this data. 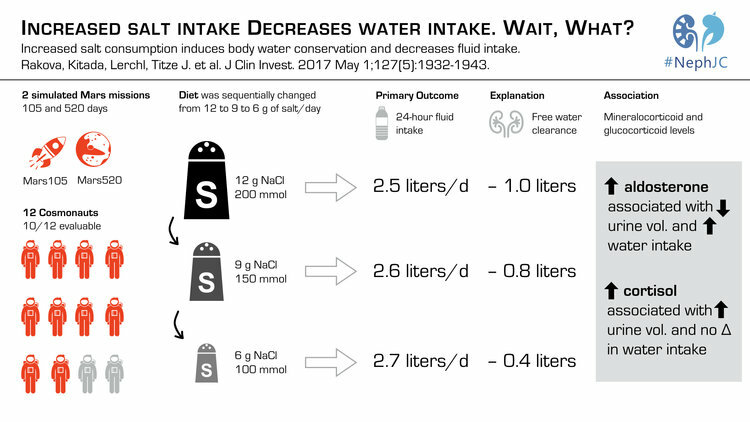 The novel concepts raised here were truly novel: whilst the kidney plays the main role in coupling water and salt in the long term, sodium excretion may follow a cyclical pattern, and thirst and water ingestion do not seem to be involved in coupling water to salt. Unsurprisingly, this was one of the most chewed over studies of the year. So, this Holiday season, you can either revisit the discussions, opinions and summaries to work your grey matter, or just sit back and watch Matt Damon’s rhythmic control of osmolyte and water. For whatever reason several clinical trials in IgA have hit the presses in the last several years. In 2015, Stop IgA Trial made it all the way to number 3. This year brings another randomized clinical trial looking at steroids in IgA Nephropathy. The TESTING trial was a multicenter, double-blind, placebo-controlled, randomized trial which tested the effect of oral methylprednisolone and clinical outcomes in patients with IgA Nephropathy. IgA Nephropathy is the most common glomerulopathy in the world with highly variable clinical presentations ranging from asymptomatic hematuria, different degrees of proteinuria and glomerulonephritis which could progress to end-stage renal disease. In this trial, 262 patients underwent randomization; 136 to methylprednisolone and 126 to the placebo group. After a median follow up of 2.1 years, the primary outcome (ESKD) occurred in 8 patients in the methylprednisolone group and 20 patients in the placebo group (5.9% vs 15.9%, p = 0.02). Recruitment was discontinued due to serious adverse events (mostly infections) which occurred in 20 patients in the methylprednisolone group and 4 patients in the placebo group. Furthermore, the annual rate of eGFR decline was -1.79 mL/min/1.73/min/1.73 m2 in the methylprednisolone group and -6.95 mL/min/1.73 m2 in the placebo group (p+0.03). 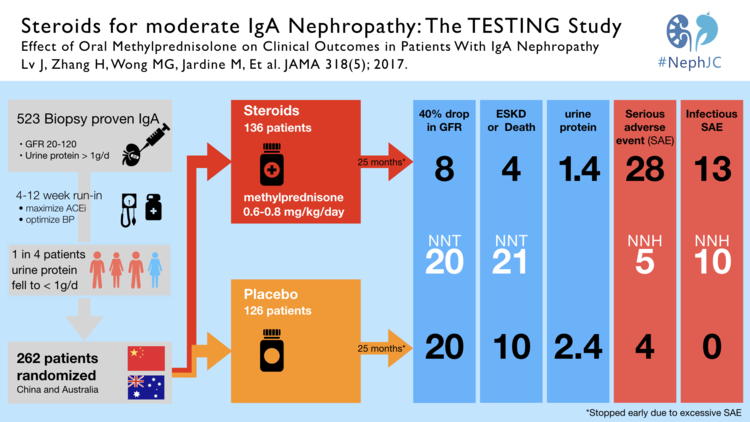 The authors concluded that the use of methylprednisolone in patients with IgA nephropathy may have a benefit, however, it is associated with a high rate of adverse events. Important to mention that another trial, STOP IgA showed that the addition of immunosuppression to ongoing comprehensive supportive care, does not add any more benefit. Read the editorial of TESTING trial here. There is an ongoing trial which will evaluate the safety and efficacy of low dose oral methylprednisolone in comparison to placebo. In March NephJC revisited a NephMadness champion, APOL1. Risk variants in APOL1 are common in people of African descent, and there is evidence that trypanosomiasis acted as a selection pressure favoring these risk alleles. This Nature Medicine paper explored the mechanisms of podocytopathy underlying development of chronic kidney disease with APOL1 risk variants. 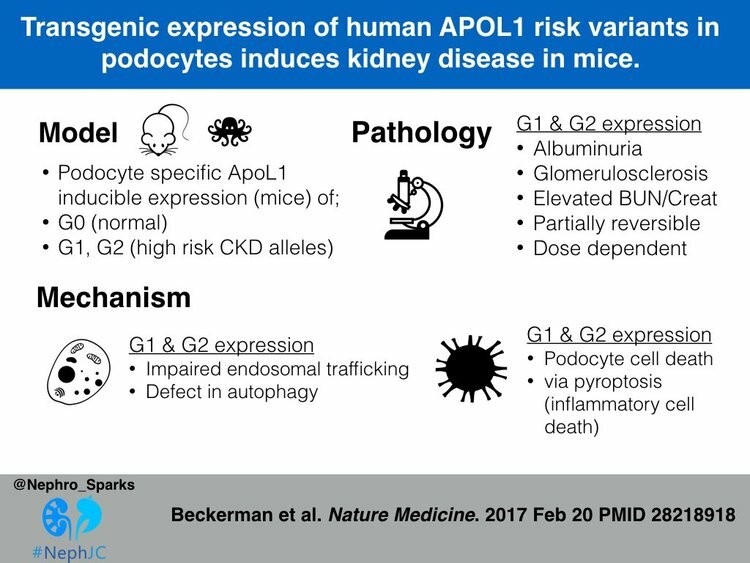 The authors, led by @KSusztak showed that APOL1 risk variant related kidney disease is podocyte specific and relates mechanistically to podocyte autophagy and pyroptotic cell death. A really neat transgenic mouse model allowed them to tease apart the mechanisms of disease. This study really thrust the APOL1 field forward, tackled some challenging experiments, and builds a story really nicely from the landmark paper describing the association of APOL1 variants and kidney disease in 2010. There are plenty of outstanding questions that we explored in the NephJC chat: why is the podocyte so susceptible? Why is HIV an additive risk? How can we target APOL1 podocytopathy? Coming in at number 7 is the MENTOR Trial which was presented at ASN Kidney Week in New Orleans. Here is the Twitter coverage collated on AJKD blog. All nephrologists know that the evidence base informing treatment of primary nephrotic syndrome is very weak. MENTOR partly rectifies this in a multicenter RCT of Rituximab versus Cyclosporine in biopsy-proven Membranous Nephropathy, the commonest cause of primary nephrotic syndrome in adults. 130 patients were randomized to Rituximab or Ciclosporin for 12 months treatment. Complete or partial remission after 24 months occurred in 62.5% of the Rituximab cohort versus 20.6% of the Cyclosporine cohort (95% CI 2.7-13.2). Patients receiving Cyclosporine had a higher risk of treatment failure at 24 months compared with Rituximab (79.4% versus 37.5%, 95% CI 24.7-55.9). Rituximab took longer to achieve remission than Ciclosporine, but Rituximab exhibited fewer adverse events. Although this study did not compare Rituximab with the Alkylating agents still recommended by KDIGO, and excluded those with eGFR <40 ml/min, it is important because it highlights the relative safety and non-inferiority of Rituximab over Cyclosporine in Membranous Nephropathy. Only when we have further similar studies will we be able to offer our nephrotic patients proper evidence-based, rather than opinion-based, care. Coming in at number 6 is something that could not have been imagined just 5 years ago. One of the greatest stories of 2017 was the use of hepatitis C virus (HCV) infected kidneys in kidney transplantation. Despite critical shortage of organs and longer waiting times, about 500 HCV kidneys are discarded annually. Two bold studies conducted separately by the University of Pennsylvania (Thinker) and Johns Hopkins University (Expander-1) pushed the envelope to utilize these kidneys. These studies tested the safety and efficacy of the transplantation of HCV-infected kidneys into uninfected recipients, followed by antiviral treatment was examined. You heard that right. Findings from Thinker were presented in annual meeting of American Society of Transplantation in 2017 and the results published in a correspondence in NEJM. This was also covered in the AJKD blog post. Performed at two separate centers in United States. A total of 20 patients received HCV-infected kidneys, with 10 patients enrolled in each center. All patients were cured of HCV following treatment with direct-acting antiviral agents. The THINKER Trial included 10 adult participants between 40 and 65 years old, that had been on the transplant waiting list for fat least 18 months. The average wait time to receive a kidney was 58 days after enrolling in the trial. All 10 patients tested for HCV as soon as 3 days Following the transplant, and received 12-week course of directly acting antiviral elbasvir/grazoprevir (Zepatier) and were cured of the HCV infection. Even though 1 patients had delayed graft function and 1 patient developed FSGS post transplant, median 6-month serum creatinine was 1.1 mg/dL. This is one of the revolutionary trials in the history of transplantation and gives hope to many patients who have been waiting for long times to receive a kidney transplant. One of the barriers anticipated is the high cost of anti-HCV medications. The drug used in the Thinker trial, Zepatier costs US $55,000, and the other anti HCV medication, Harvoni, costs US $94,000. As the trials are currently being expanded to enroll more patients, it would be interesting to see the long term graft and patients outcomes following transplantation of HCV infected kidneys into HCV-negative recipients along with a cure of HCV infection. The American College of Cardiology and the American Heart Association (ACC/AHA) released the new hypertension guidelines in November. These now replace the JNC (Joint National Committee) guidelines, the last version which were published in 2014 (the JNC-8). JNC-8 was published after the NIH had already announced that they were getting out of the guideline business, and were dogged by controversy, for the delay as well as a minority report that was published disagreeing with the main report. And of course, the SPRINT trial was published a year later, which has changed much about what we know about hypertension targets. The 2017 ACC/AHA incorporate data from SPRINT, and much more, backed by a comprehensive literature review which was released concomitant with the actual guidelines. The one big message is 130/80 as the new target blood pressure. For everyone. It seems to be a very pragmatic decision, eschewing the actual 120 target from SPRINT, but also expanding the 130 target for patient populations not included in SPRINT. As with any guideline, there has been a lot of angst and disagreements - so look forward to a NephJC discussion in the new year. All the guidelines are easily available at guideline hub, with a simpler summary also available here. This year at Kidney Week 2017 as a part of the Late-Breaking and High-Impact Trial Session Vicente Torres presented the REPRISE Trial and later that week it was published in NEJM and covered by NephJC. In 2012, the TEMPO 3:4 trial showed a reduction in growth of the total kidney volume and as a secondary outcome showed decreased progression of CKD. As a side note this trial made it to #1 in our “Top Nephrology Stories of 2012”. Tolvaptan was approved for its use in Europe but in America the FDA requested further safety data and wasn’t approved. As you can imagine there was a some disappointment among the nephrology community. Based on this, the investigators conducted the REPRISE Trial. In the REPRISE Trial they enrolled patients with more severe kidney disease than in TEMPO (GFR 25-65). The primary end-point was change in creatinine-derived eGFR. Loss of eGFR was reduced by tolvaptan from 3.61 ml/min/year to 2.34 ml/min/year (p<0.001). This is 1.27 ml/min/year reduction compared to placebo. These findings will be presented to the FDA in 2018. Will the US have a new drug to treat ADPDK? We will find out soon. EMPA-Reg was a landmark study that showed that the SGLT2-inhibitor, empagliflozin reduced mortality in type 2 diabetes. This was number 2 in the Top Nephrology Stories of 2015 and then returned in 2016 with number 4 when the FDA gave empagliflozin a license for reducing mortality in type 2 DM. However, a lot of people were on egg shells worried that the empagliflozin-story was just too good to be true. 2017 delivered CANVAS which showed that canagliflozin, another SGLT2i, reduced the composite endpoint of cardiovascular mortality, non-fatal stroke and non-fatal MI. CANVAS validated the findings of EMPA-Reg and solidified SGLT2i as a major breakthrough in the treatment of diabetes. The CANVAS trial was discussed in NephJC and was the subject of grand rounds by Christos Argyropoulos and Joel Topf. CANVAS validated the cardiovascular outcomes of EMPA-REG but also brought a lump of coal. The risk of lower limb amputations with canagliflozin was twice that of patients in the placebo group. The reason for this is unclear and as of now this signal has not been seen with other SGLT2i, but this finding will certainly be on minds of physicians and data safety monitoring boards around the world. This was the long awaited medical reversal, almost two decades in coming. In 2000, the first trial which reported the benefit of acetylcysteine in reducing contrast induced acute kidney injury (CI-AKI) was published. Despite doubts and uncertainties about its mechanism as well as purported protective effect, its use became widespread over the next few years - after all, there were little downsides. In the last few years, more negative trials were published, most notably the ACT trial in 2011, but being in lower risk patients, it was not definitive enough (the KDIGO guidelines still recommended its use). Similarly, in 2004 a trial reported the protection conferred by a bicarbonate based intravenous volume expansion around the time of the contrast exposure. This upstart replaced the previous accepted standard of normal saline. Similar uncertainties about any real difference between bicarb and saline followed. Now in one stroke, the PRESERVE (prevention of serious adverse events following angiography) trial took away both these purported protective pharmacotherapies. Randomizing just over 5000 patients, in this trial funded by the Veterans Affairs, there was absolutely no difference between acetylcysteine and placebo, or bicarb vs plain old saline. Indeed, the trial was stopped early for futility earlier given the absolute lack of difference noted between acetylcysteine and placebo. Read the discussion from NephJC here. SuPAR is #1, the suPAR enthusiasts come out in force with the heavy voting and it is not a surprise as suPAR has been a consistent story for the last eight years. Last year, it hit the number 1 spot with a basic science paper published in Nature Medicine. In 2011, suPAR was ranked #1 TopNephrology stories with the original Nature Medicine paper describing its potential link to FSGS. In 2015 suPAR landed at number 14 with the NEJM paper linking suPAR to CKD in a cohort of patients at Emory undergoing cardiac catheterization. The current study looked at the association between suPAR, Apolipoprotein L1 (APOL1) risk variants, and eGFR decline in two separate cohorts of individuals of African ancestry. It was found that plasma suPAR levels independently predict renal function decline in individuals with two copies of APOL1 risk variants. They also explored the possibility of a protein–protein interaction between suPAR, APOL1 and αvβ3 integrin and showed that the G1 and G2 risk variants of APOL1, but not the reference protein G0, synergize with suPAR in the activation of αvβ3 integrin on podocyte. This binding causes change in structure and function, allowing disease onset. Using cell models and genetically engineered mice, the authors reproduced kidney disease changes upon expression of APOL1 gene variants, but the disease required the presence of (high level) suPAR. African Americans have a higher rate of kidney failure than any other group of people. In fact African Americans are four to five times more likely to have kidney failure then Americans of European descent. The discovery of the genetic variants in the APOL1 gene along with the findings of this study may explain a large fraction of this major health disparity. Thanks to everyone for supporting NephJC over the last year. The growth and participation has been phenomenal. The sky is the limit. We look forward to spirited debates and continued duals between #TeamSwap and #TeamRodby. Continued debate and discourse of scientific literature is what is needed to advance science forward to benefit patients. Happy holidays and new year to all. Patient Perspective: Vasculitis patients and prednisolone: good and bad? The investigators round up patients' feelings about glucocorticoids. Turns out these drugs have side effects. The next NephJC will be on Avacopan for ANCA associated vasculitis. Please join us. Precision Medicine & CKD: A Call to Arms or a Howl at the Moon? Red Meat: What is it good for? Red meat causes ESRD? Say it isn't so! #NephJC chat on August 23 and 24. In the penultimate chapter, Topol turns to the developing world and how digital technologiee have the potential to improve health for the poorest humans.